Massachusetts Co-op Breweries Road Trip Report! At the inspiration of Full Barrel board Secretary Kiersten Hallquist, we’ve been aiming to do fun member events each month. So, for November, I decided to organize a road trip to visit the three co-op breweries to our South in Massachusetts: Artisan Beverage Co-op in Greenfield, 3cross Fermentation Co-op in Worcester, and Democracy Brewing in Boston. I was joined on the journey by our Vice President Andrew Gansenberg and Treasurer David Smith, and we rolled out from Burlington for our adventure on the morning of Saturday, November 10. We arrived in Greenfield around noon, and, since our meeting was for 12:30, headed past Artisan Beverage Cooperative (ABC) to stop off at a neighboring brewery that opened at noon. En route, it quickly became apparent that ABC sits in a little cluster of worker co-ops. Within a stone’s throw is PV Squared (a solar installation company), Real Pickles (a fermented foods manufacturer), and an outpost of Equal Exchange, which is the biggest worker co-op in New England. ABC itself occupies space inside a multi-tenant industrial building run by the local economic development agency, and, after a moment of slightly-confused searching, we found co-founder Garth Shaneyfelt. Garth led us to their tasting room and, after trying a few variations of their Ginger Libation and Kombucha, we settled in to hear their story. ABC emerged initially via the merger of a small kombucha and a mead manufacturer in 2013, and now boasts a workforce of about 12-15, with five of those folks currently member-owners of the worker co-op. New employees must work for two years to qualify for membership, at which point that have the opportunity to purchase a share, which is $15,000. 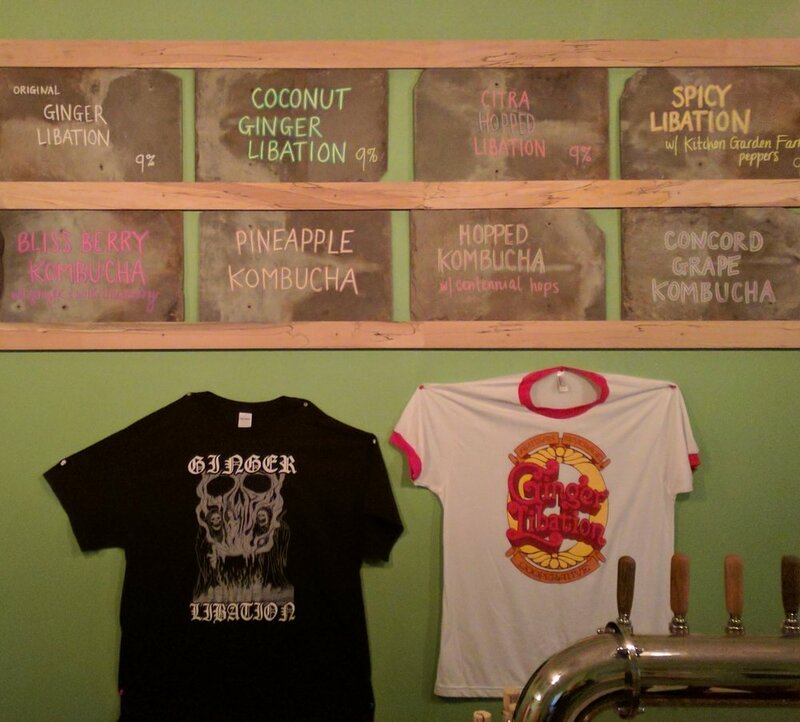 At the moment, Artisan is primarily focused on distribution; the tap-room is small, but their flagship Ginger Libation can be found across New England, including in Burlington’s own City Market. They’ve just started experimenting with adding beer to their offering mix, and their first stab at it, “Beer #1”, was on tap during our visit. Garth gave us a quick tour of their facilities, and we discussed their thinking about expanding to a larger foot-print, more central location for a taproom in the future. After a lovely ramble through Western Massachusetts that included a lunch stop at Stone Cow Brewing, we rolled into Worcester where we found 3cross in the basement of an old building beneath a glowing sign proclaiming “Games!” After passing through the low fence constructed of shipping pallets that surrounds the parking-lot patio, we found worker-owner Heather Odell chatting with a few regulars, including one of the brewery’s consumer board members. 3cross is unique in the American co-op brewing world as the first with a “multi-stakeholder” ownership structure, which is used by a few grocery co-ops in the US, and is more common in Quebec, where Ma Brasserie in Montreal was the first to utilize the model. Originally founded and owned by its brewer, 3cross’ journey to co-op ownership came in two steps. First, the two other employees joined the founder as members on a worker cooperative basis. Then, a class of consumer members was created, in which any customer can join by purchasing a share for $150, and close to 140 people have done so at the time of writing. The purchase was financed primarily by a “seller’s note” loan made by the founder, who will retain the right to be the board chair until the debt is paid. The co-op’s bylaws specify that worker-owners always elect one more board seat than consumers, so the co-op currently has a board of 5, consisting of all three workers and two consumer members. Profits are also split between the two groups, with the workers getting their share on the basis of labor contributed, while the consumers get their cut on the basis of dollars spent at the brewery. In many ways, it sounded like 3cross is able to access the “best of both worlds” of employee and consumer ownership. On the one hand, the worker members have a majority voice in the strategic decision-making and a stake in the financial performance of the business. On the other, consumer members are invited to get involved in a variety of ways beyond electing board members and getting a little money back at the end of the year. The co-op maintains a tap that only members can order from, members vote on what charities the contribute the tip jar to (they are a no-tipping, living-wage establishment), and members can submit beer recipes that, if chosen, they can help brew. The list of member benefits was significant and creative, including a members-only tap, and got our juices flowing as we consider the future of Full Barrel. After the scrappy, modest scale of the first two stops on our tour, Democracy Brewing was quite a change of pace. Located in the heart of Boston a short walk from the Common, this worker co-op raised over a million dollars in capital for its build-out prior to opening on July 4th, 2018. Employing 30 workers and sporting a 10 barrel brew system with 20 barrel fermenters, Democracy has quickly established itself as a thriving neighborhood establishment. Arriving at dinner time on a Saturday night, the place was hopping. Co-founder James Rasza got us beers while we waited for a table and visited with a few other local co-op folks who joined us, including Chris Mackin of Ownership Associates and Greg Brodsky of the Independent Brewers Alliance. Once we secured a table and ordered from their solid pub menu, James dove into the story of their development. It took several years to get from idea to the solid business we encountered that night, and the scale of the project required some fairly sophisticated and innovative approaches to financing. Loans were secured from the three major Community Development Financial Institutions that support co-op development (CFNE, LEAF, and Shared Capital Co-op), and a structure was devised to attract additional risk capital that combined a target dividend rate with a modest revenue share. Following the heady dinner discussions, James led us below ground, where the brewing and food prep happen. After a tour of the facilities, he discussed the travails of the build-out process and the challenges of working with contractors and sub-contractors and sub-sub-contractors. It was clear that a lot of blood, sweat and tears went into bringing the happening, convivial space above us into being, and James expressed interest in helping others on the path. Towards that end, Democracy takes a page out of the European co-op movement’s book and commits 5% of its profits towards supporting co-op development. As they grow, James hopes that will fund the ability for him to devote a substantial number of hours to helping other co-ops be established, grow, and thrive. In all, the trip was both fun and extremely educational, and a few themes emerged for me. Employee Ownership: All the co-ops we visited had some level of employee ownership: ABC and Democracy entirely as worker co-ops, and half of 3cross. Being modeled on Austin’s Black Star, Full Barrel is currently a consumer co-op, so these models definitely got me thinking about our structure as we move towards launch. I think there’s a key and powerful element to consumer membership, but the opportunity to share in the success of the business does offer a significant benefit to workers that could translate into more retention, engagement, etc. So, I definitely would like to research how a 3cross-style multi-stakeholder co-op might work under Vermont’s legal framework to determine how a worker class of shares might fit with our model. Start-up vs. Conversion: Both ABC and 3cross became co-ops as a result of existing businesses converting into co-ops, though in slightly different ways. ABC was something of a merger of equals between existing businesses, while 3cross’ origin was with a single founder deciding to broaden ownership such that he was on both the buy and sell side of the equation. By contrast, Democracy Brewing was a true start-up. The core of founding worker-owners worked on the idea for years, business planning, building skills, and recruiting capital until they were able to line up all the factors and launch a new establishment from scratch at significant scale. That difference could really be felt, in that ABC and 3cross definitely still felt scrappy and boot-strapped in many ways, adding capacity as they could, while you could not tell that Democracy felt as though it could have been there a decade or more, despite being less than 6 months old. While that’s not enough time to render any sort of final judgement on the merits of one approach or the other, the ability to come out of the gate seemingly fully capitalized seems to be a contributor to their success. On this front, Full Barrel has, from time to time, both reached out to and heard from existing brewers on the possibility of acquiring their operations. Those conversations have not gone far enough to be serious, so our co-op’s path is looking more like Democracy’s “raise and build new” approach, albeit on a smaller scale. Distribution: Of the three breweries, only ABC was primarily oriented towards off-site distribution. As Full Barrel is primarily aiming for on-site distribution, the impact of location was quite apparent in the comparison between 3cross and Democracy Brewing. The former, in an off-the-beaten-path location, was relatively quiet for a later Saturday afternoon with regulars at the bard, while the latter, being in the heart of Boston, was bursting at the seams at dinner-time with a more generalized downtown crowd. My takeaway from this is, as we assess both the viability and strategy for our future location, is that we will need to be clear how much active marketing and organizing we’ll need to do to draw in beer drinkers, versus how much organic foot traffic we can reasonably expect from the environment. In all, the trip was a blast, combining good beer and an opportunity to get to know some fellow board members on a deeper level. I’m thinking we’ll follow up this experience in a few monthly by organizing a trip north of the Border to drop in on a few co-op breweries in Quebec. If you’re interested in potentially tagging along, and being part of Full Barrel’s next steps, join up as a member!